Mail Today newspaper, part of the India Today Group, is awestruck by this blogsite. Perhaps the most compelling and attractive Indian blog I have come across is the delhiwalla blog run by Mayank Austen Soofi. 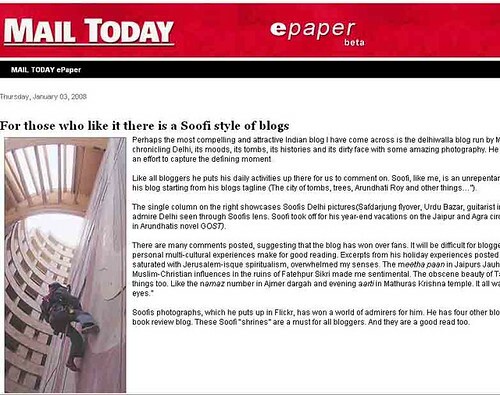 Soofi is a creative photographer chronicling Delhi, its moods, its tombs, its histories and its dirty face with some amazing photography. He takes pains to avoid the clichéd angles and there is an effort to capture the defining moment. Like all bloggers he puts his daily activities up there for us to comment on. Soofi, like me, is an unrepentant and unabashed fan of Arundhati Roy who is all over his blog starting from his blogs tagline (The city of tombs, trees, Arundhati Roy and other artists…”). The single column on the right showcases Soofis Delhi pictures (Safdarjung flyover, Urdu Bazar, guitarist inside Barista). Its worth visiting the blog just to admire Delhi seen through Soofis lens. Soofi took off for his year-end vacations on the Jaipur and Agra circuit with what he wryly calls “Roys twins” (Esta-Rahel in Arundhatis novel GOST). Soofis photographs, which he puts up in Flickr, has won a world of admirers for him. He has four other blogs including one called “Pakistan Painabad” and a book review blog. These Soofi “shrines” are a must for all bloggers. And they are a good read too. Opinion – What's Wrong with The Delhi Walla? Soofi has a refined quality to his works, as he is the main writer and photographer for the blog. I wish Mayank lots of success and best wishes. Make this a meaningful year! Would love to see a photo-exhibition by Mayank, soon.